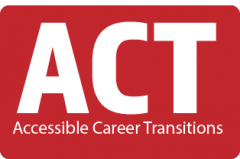 Accessible Career Transitions (ACT) is a career development program which provides support to Carleton University students and alumni with disabilities. ACT is a collaborative program between Career Services and the Paul Menton Centre for Students with Disabilities and READ Initiative. To register with ACT, fill out the ACT registration form. To learn about the services that are offered through ACT, see What ACT services are available to me? The following links provide information about disability disclosure, accommodations, interview preparation, invisible disabilities and mental health and employment resources.